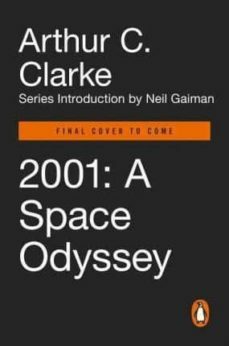 A deluxe hardcover edition of the wondrous space adventure that is the basis for Stanley Kubricks Oscar-winning filmpart of Penguin Galaxy, a collectible series of six sci-fi/fantasy classics, featuring a series introduction by Neil Gaiman Written when landing on the moon was still a dream, 2001: A Space Odyssey is a science-fiction classic that has changed the way we look at the starsand ourselves. On the moon, an enigma is uncovered. So great are the implications that, for the first time, men are sent deep into our solar system. But before they can reach their destination, things begin to go very wrong. From the savannas of Africa at the dawn of mankind to the rings of Saturn at the turn of the 21st century, Arthur C. Clarke takes us on a journey unlike any other. Brilliant, compulsive, and prophetic, and the basis for the immensely influential Stanley Kubrick film, 2001: A Space Odyssey tackles the enduring theme of mansand technologysplace in the universe and lives on as a landmark achievement in storytelling. Penguin Galaxy Six of our greatest masterworks of science fiction and fantasy, in dazzling collector-worthy hardcover editions, and featuring a series introduction by #1 New York Times bestselling author Neil Gaiman, Penguin Galaxy represents a constellation of achievement in visionary fiction, lighting the way toward our knowledge of the universe, and of ourselves. From historical legends to mythic futures, monuments of world-building to mind-bending dystopias, these touchstones of human invention and storytelling ingenuity have transported millions of readers to distant realms, and will continue for generations to chart the frontiers of the imagination. The Once and Future King by T. H. White Stranger in a Strange Land by Robert A. Heinlein Dune by Frank Herbert 2001: A Space Odyssey by Arthur C. Clarke The Left Hand of Darkness by Ursula K. Le Guin Neuromancer by William Gibson For more than seventy years, Penguin has been the leading publisher of classic literature in the English-speaking world. With more than 1,700 titles, Penguin Classics represents a global bookshelf of the best works throughout history and across genres and disciplines. Readers trust the series to provide authoritative texts enhanced by introductions and notes by distinguished scholars and contemporary authors, as well as up-to-date translations by award-winning translators.